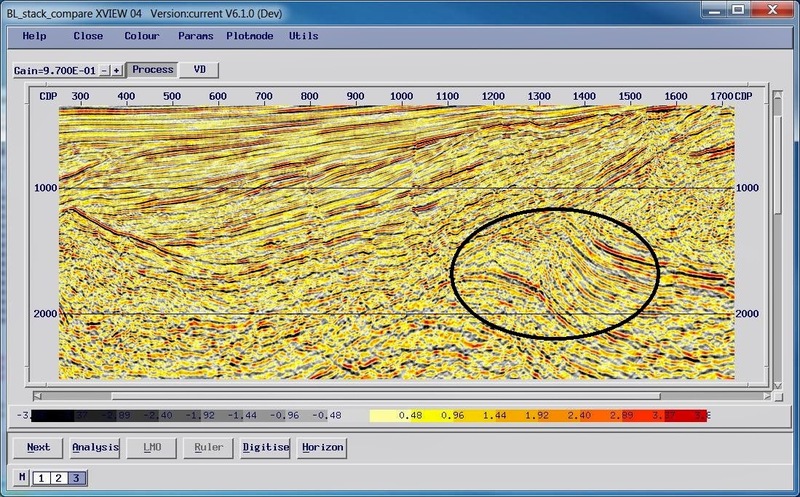 In practice, we only get coherent reflections (that are in the correct lateral position) when the rock layers are flat and continuous. One way to think of this is to consider the “zero-offset normal ray” section. 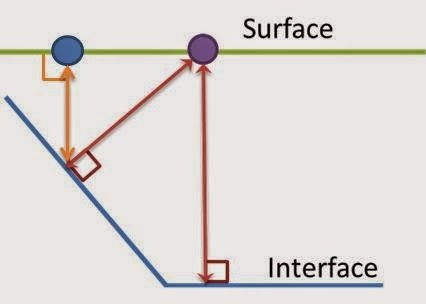 This is where the reflected ray-path between a source and receiver at the same location at the surface makes a right-angle with the reflecting layer. In effect the “zero offset normal ray” section is a stack – we have corrected the source-receiver offset to zero using the NMO correction on a CDP gather, and then stacked (summed) the traces together. 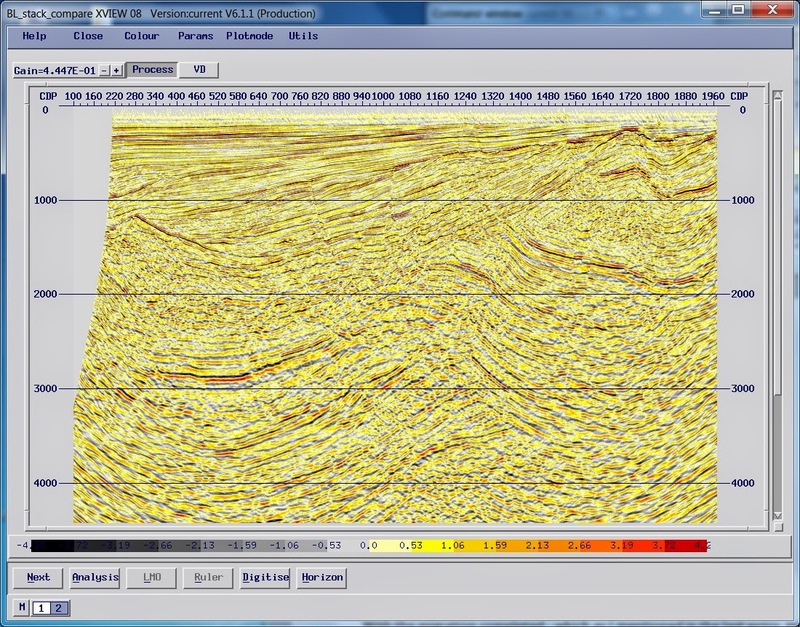 As well as the “ray path” view we can also think of how waves propagate based on Huygen’s Principle. 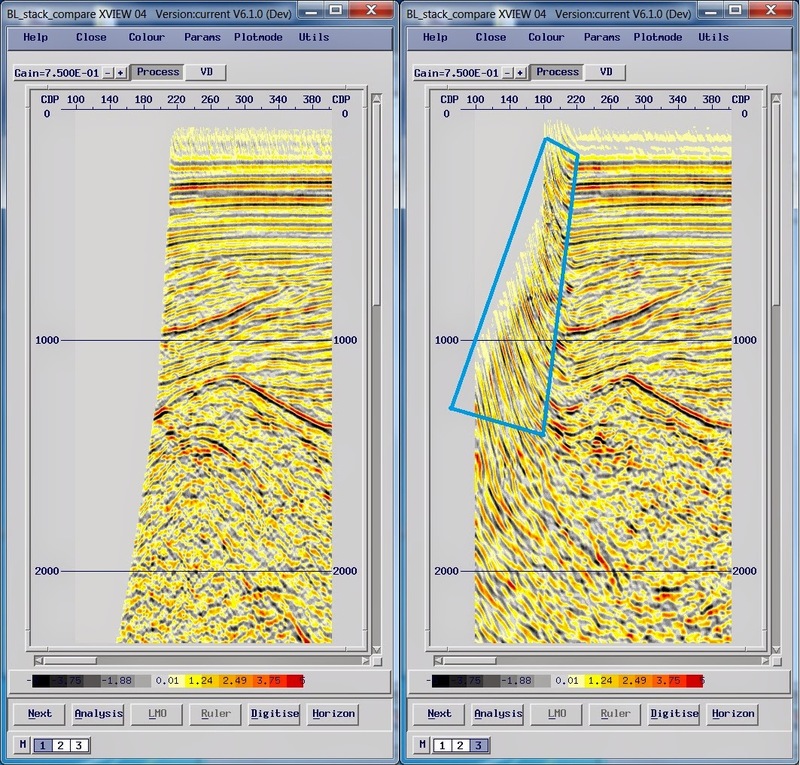 Where we have discontinuities (such as faults, or intrusions) the secondary wavelets used in Huygen’s construction will not fully constructively or destructively interfere, giving rise to diffractions. In order to resolve these issues we need to migrate the data. 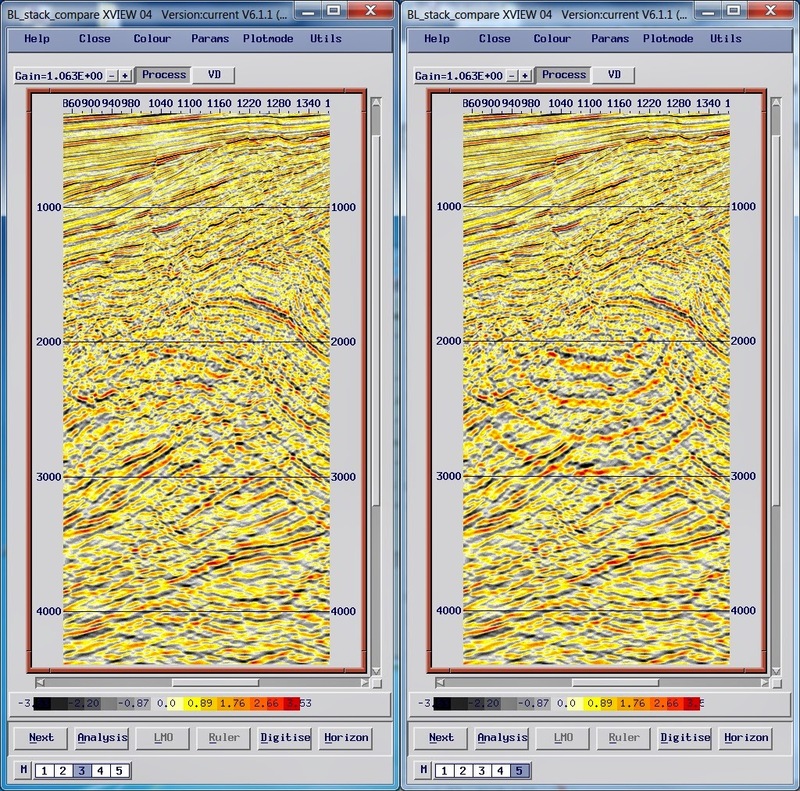 Stacked (left) and migrated (right) portions of the TRV-434 seismic line. The migrated events are a little steeper and have moved laterally up-dip. Diffractions caused by faults and events that are not continuous have been collapsed. Crossing complex events have been resolved. Migration uses a mathematical model to reposition data to its correct lateral position and collapse diffractions. 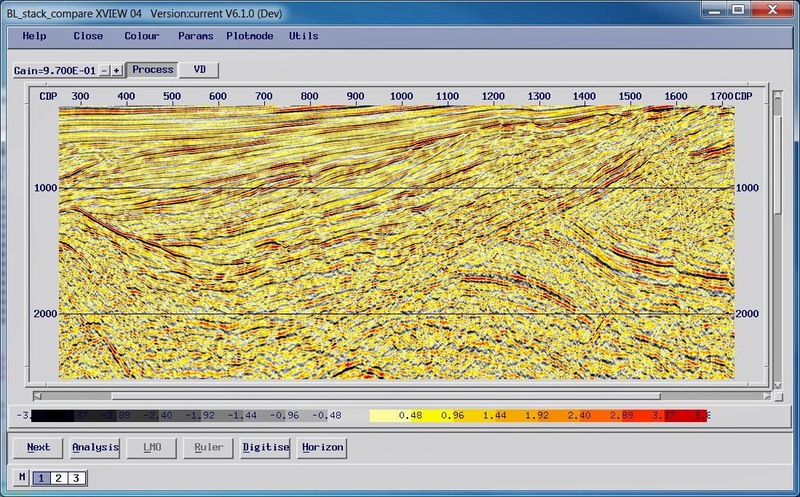 This usually requires some kind of velocity model; as computation speeds have improved it has become practical to use algorithms that can work with more complex – or realistic – velocity models. Post stack migrations (of the type shown above) have largely been replaced by pre-stack migration techniques. 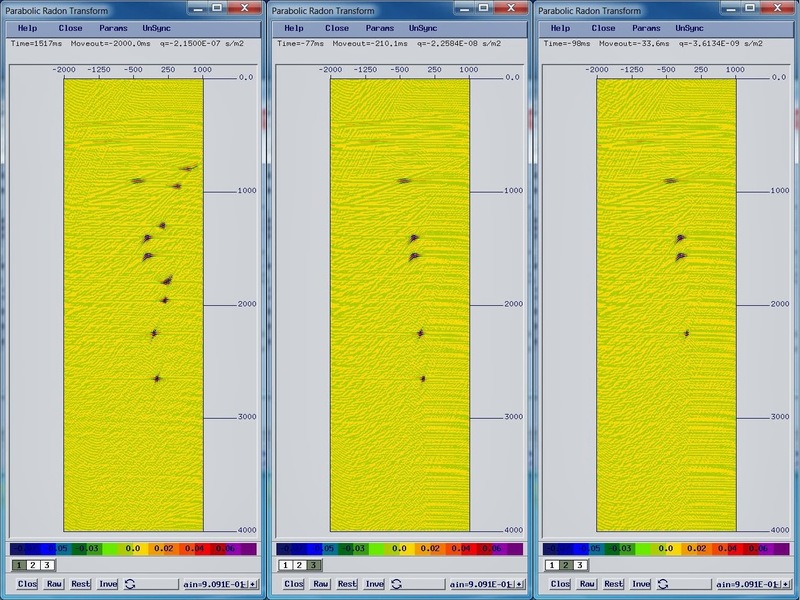 In pre-stack migrations the data are formed into offset planes which are migrated to their near-offset position and time, which replaces the NMO correction and the migration stage. 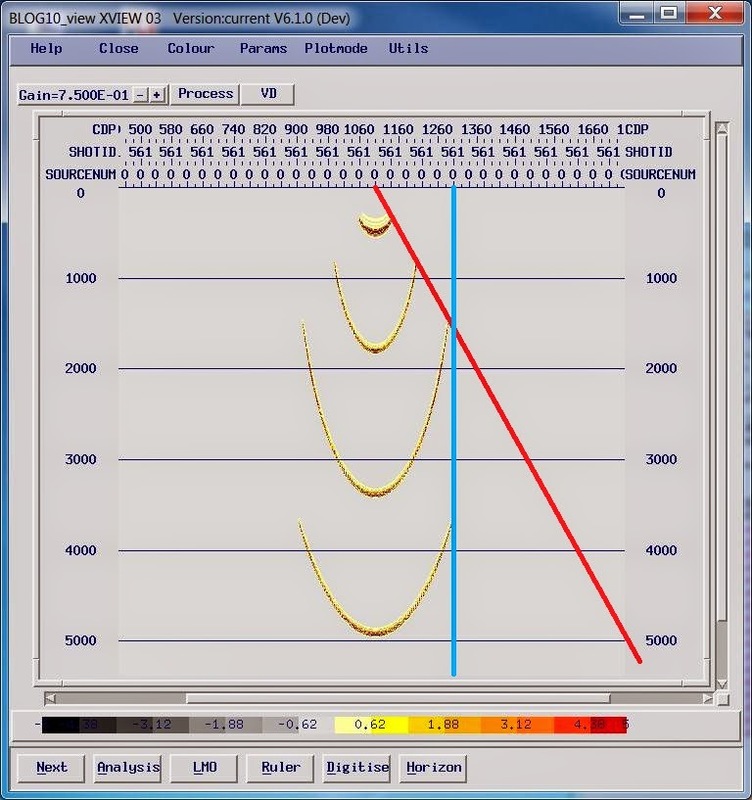 In this case the line we are working on has some fairly steep dips and complex ray-paths; after a couple of rounds of velocity picking you will have come across some situations where the velocities are hard to pick; this is because we have diffracted events (which do not have hyperbolic moveout) as well as dipping events. Dipping events cause problems not only because the reflection hyperbola is distorted, but because the “common mid-point” is smeared and shifted up-dip. Pre-stack migration resolves this issue allowing better velocities to be picked and improved focussing to be obtained on dipping events. For that reason it is common to create a new velocity field after pre-stack time migration, and, in some cases, run a second iteration of the pre-stack time migration with that new velocity model. Velocities picked on pre-stack time migrated data are a better approximation to the actual RMS velocity of the sub-surface layers, and so can be more useful as a starting point for depth conversion. 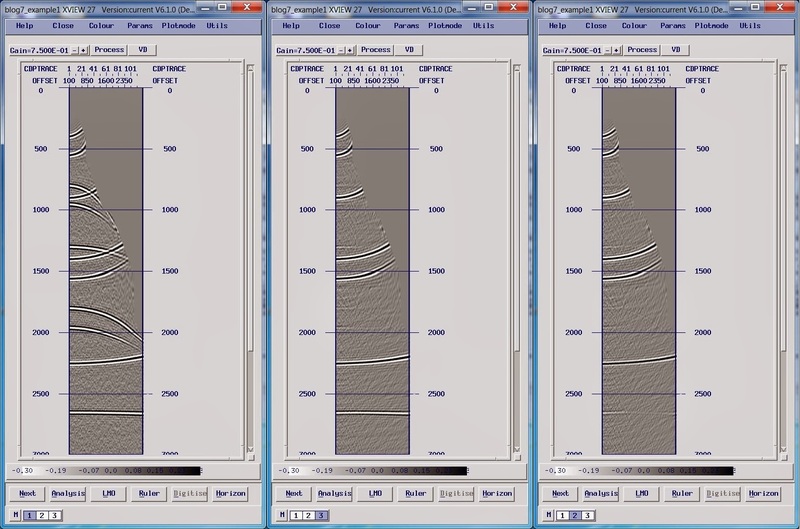 A good way to understand the migration parameters is to look at some impulse response functions; this will show you the shape of the migration operator with different parameters. You can do this by zeroing all of the traces, and placing some suitable ricker wavelets at different time values then running migrations. The parameters we can vary do two things. They serve to speed up the migration (by limiting the operator in terms of its spatial extent) as well as reduce or remove artefacts from the data. The main artefacts we want to eliminate are wavelet stretch, which occurs for the same reason as NMO stretch which picking velocities, and aliasing of the operator shape. The operator becomes aliased because (usually) the vertical sampling of the data (time sample interval converted to distance) is at a much higher resolution than the horizontal sampling (the CDP spacing). 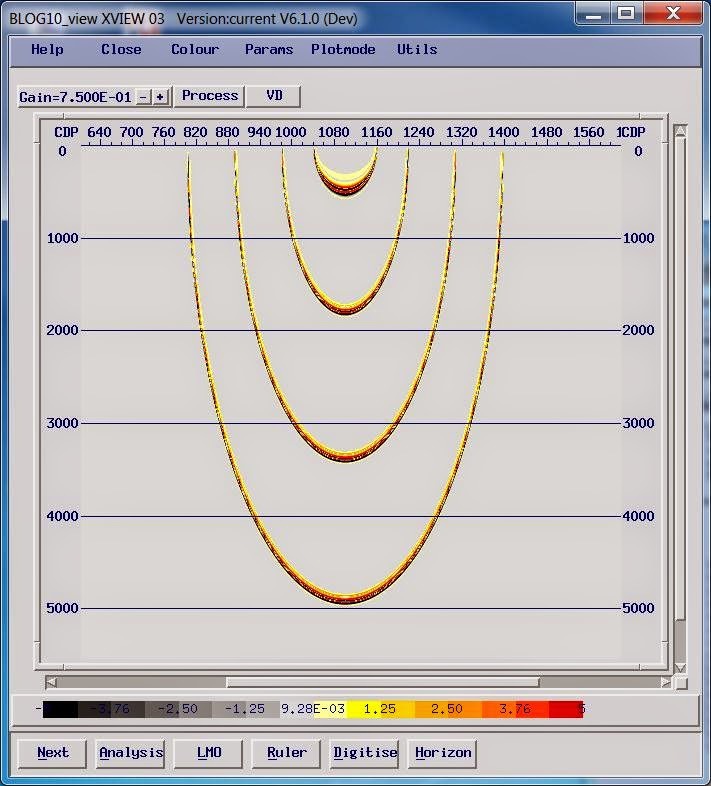 In this case, we have a 4ms sample interval at a constant velocity of 1480ms-1, which corresponds to a 2.96m vertical resolution (remembering we are looking at two-way-time), and the CDP spacing is 12.5m. As a result the operator will be spatially aliased at high angles. The horizontal distance that a trace is allowed to migrate. Cuts off the migration operator at a specific distance, usually from the CDP position of the trace pre-migration. Reduces how many input traces contribute to each output trace, and so makes the migration run faster. Reduces the ability to image steep dip, deep events. 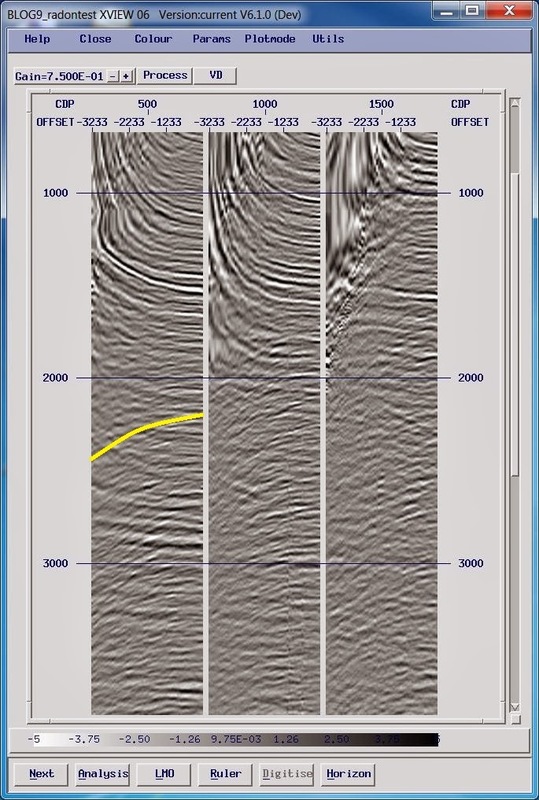 Limits the maximum angle of the migration, usually measured from the vertical trace at the CDP location out to the operator, so that 90 degrees is horizontal. Reduces how far each trace migrates, so requires less calculation runs more quickly if applied in the algorithm and not as a mute. Can act as a way of reducing both stretch and aliasing, and is approximately the maximum dip to image. 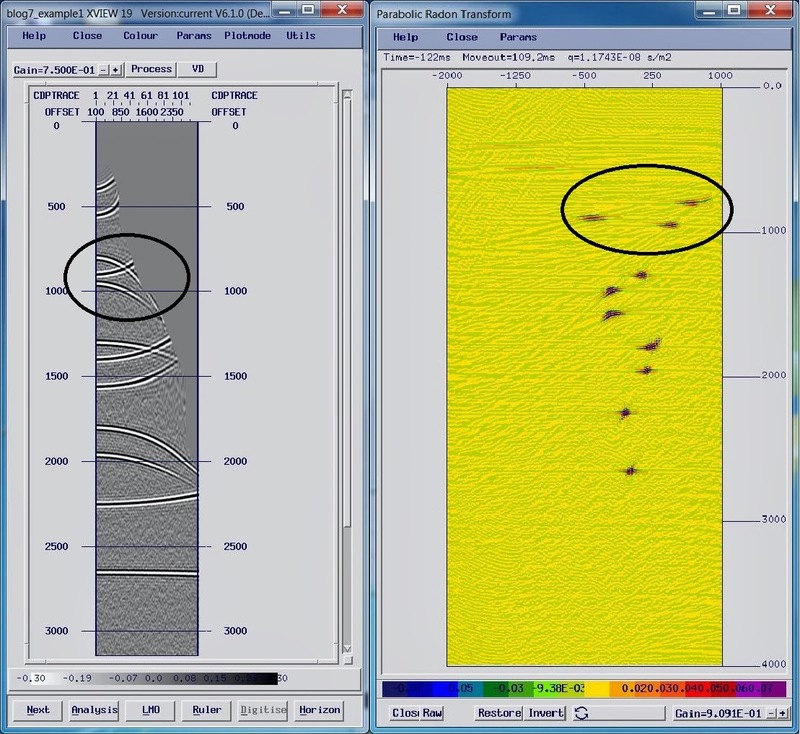 Little impact on speed of migration, as it can be computationally expensive to compute the limits even though less data is migrated; if applied as a mute can actually slow down the migration. 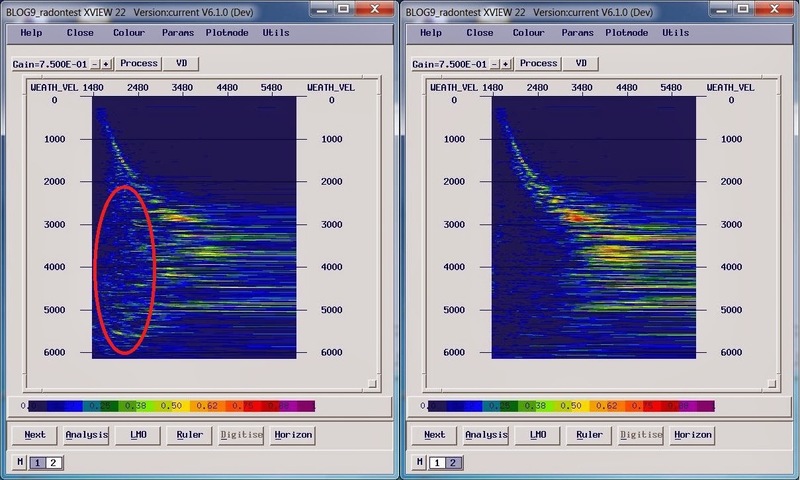 Avoid artefacts where you have rapid lateral or vertical velocity gradients, and a single dip value is inappropriate. Acts to limit the operator if the shape of the wavelet is too distorted in time. Similar effect to NMO stretch. 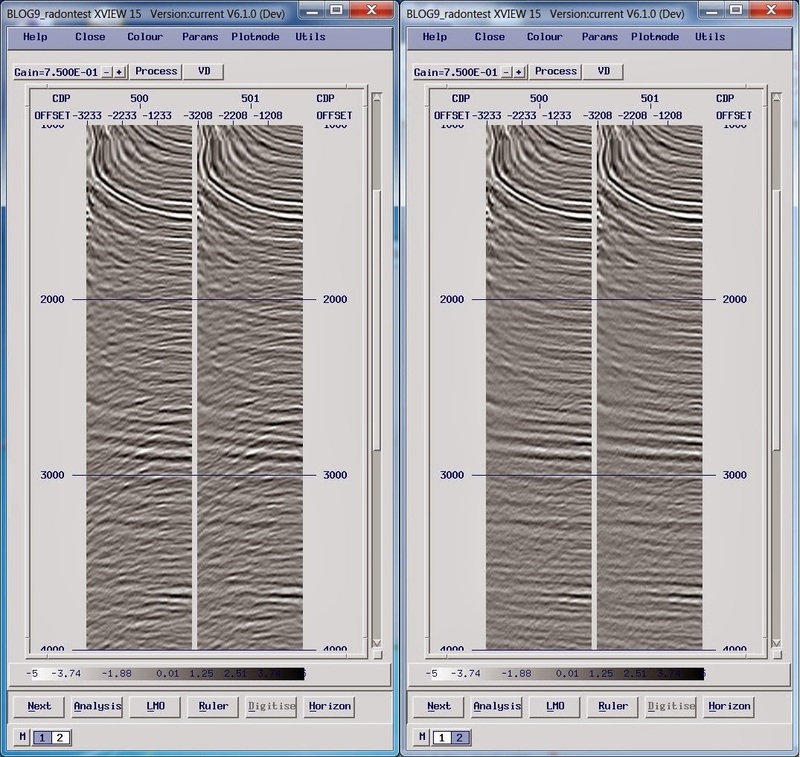 Reduces low-frequency artefacts in the shallow-mid portion of the data. May cause the near surface to be muted, unless there is a “near angle protection” option. Pre-stack time migration is a zero-offset 'image ray' migration. 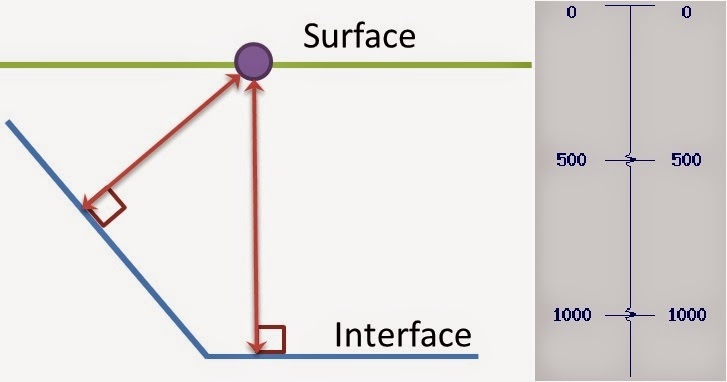 This means the results will look like data that has zero offset between source and receiver. However, unlike the NMO correction, these will also be corrected for the dip of any reflectors. 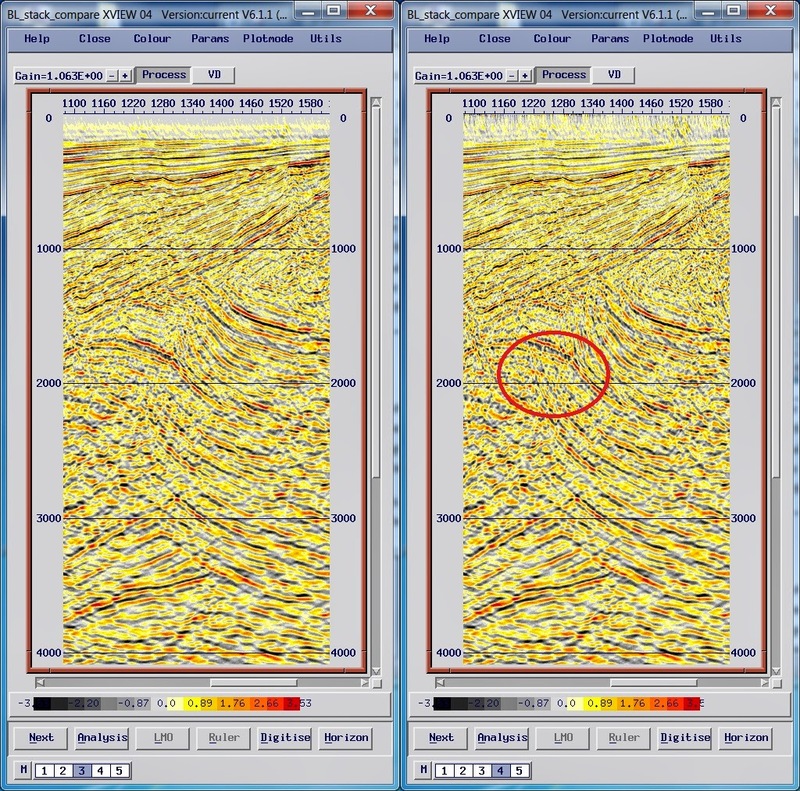 In the zero-offset 'image ray' migration, the rays are normal to the surface - not the rock interface. In practice, these are all likely to be approximations. 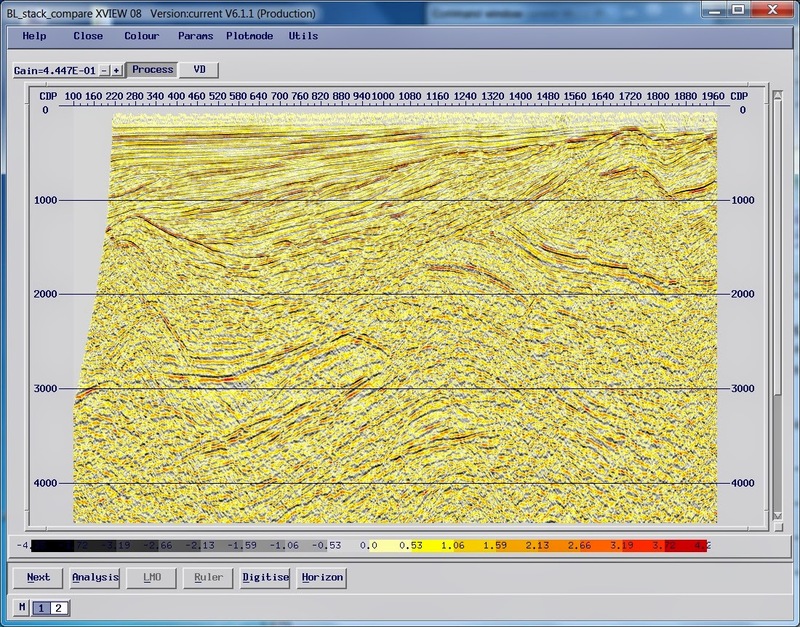 The velocities we supplied came from normal-ray gathers, and so as we identified earlier they are contaminated by dip. Beyond 45° or so, we need to start worrying about anisotropic behaviours; this is where the simple second-order normal moveout equation breaks down and we must pick higher order terms and use anisotropic migrations. 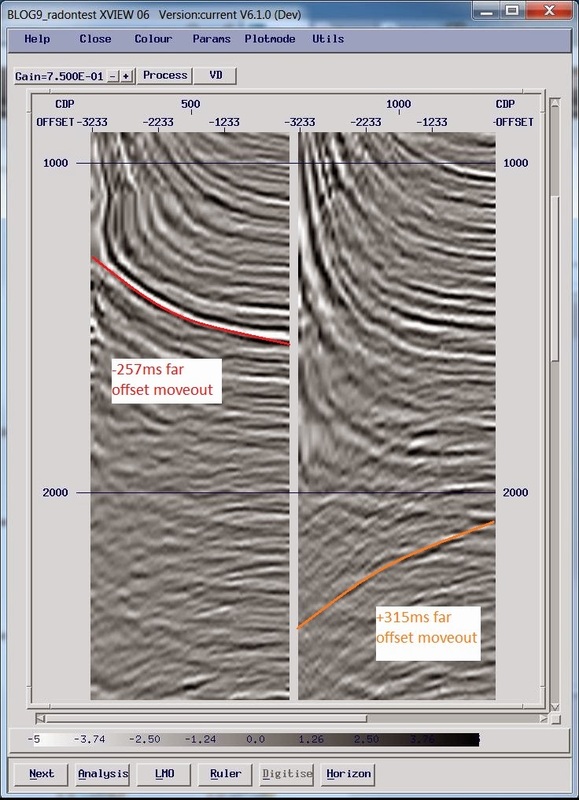 Finally, if we have significant refractions as a result of rapid lateral or vertical velocity gradients, then we need to think about using a pre-stack depth migration. pick the velocities (sometimes called picking residual moveout or RMO) before making a final stack. If the residual moveout is large it might be worth using the new velocity field and running a new migration. This could be another iteration of the same algorithm, however if there are non-hyperbolic components to the residual moveout then you might need to consider if it is worth the time and effort to move to a more sophisticated migration algorithm.